Karate Classes for Kids Ages 4 & up! Does your child have problems making the team? Does he get discouraged when he is not able to participate? Do you wish your child could just be a part of something that is positive, focused, healthy and organized? Would you like your child to be involved in an activity a little less competitive and more cohesive to building on his strengths and improving his weaknesses? Then keep reading because we've got the cure for you! Martial Arts training has transformed and increased many kids into confident young girls and boys. We'll involve your child in a positive activity that will direct his focus and attention to achieving goals that you may have thought were not possible. Interaction and socializing with other kids to be "The Best" that they can be. Learning new skills that develop balance, better atttention, discipline, memory and fitness to name just a few. We work with all kinds of kids who start out with attention deficit disorder, poor self-esteem and lack of coordination. We want to help your child reinforce their positive traits through our martial arts program. Specifically what will your child learn? How to stand at attention, greet other kids, be a good partner, improve listening skills, have the proper response to bully confrontations, be put in confidence building situations such as sparring, kata and self-defense scenarios. Your child will have the chance to grow in a positive, safe environment where success is measured by individual achievements, positive correction and praise. Hear what others have to say about our program! "I wasn't sure how much to write. I could probably write a book. When Brian started karate he was as shy, timid, and unathletic as a kid could be. Brian has made tremendous improvement in his speed, strength, coordination, and self esteem. The classes, camps, seminars, competitions, gold team activities, parties, and friendships have become an important part of his life. 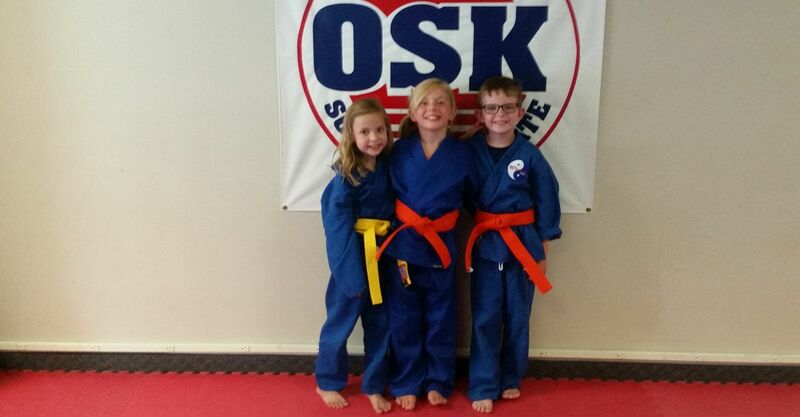 For parents considering enrolling their children in OSK, if you commit for the long term you won't be disappointed. I believe that every child should be involved in some type of physical activity. I also believe that there are more long term benefits to the martial arts than any other sport my son could be involved in." Karate has taught me a lot. It has taught me to be ready. And it taught me to guard punches and kicks. And a lot of other things. Karate has changed my life. It has changed my life by teaching me respect. It has taught me how to not be rude to parents. It has taught me how to show other kids to be good and listen to their mom or dad. Mr. Webb has taught me all of these things. "I have seen a big change in my son Isaiah since I've been bringing him to OSK. He has more focus and is more disciplined. He takes his karate very seriously. Michael Webb is very patient with the children, and really help them where they need help." "My son was initially signed up for karate to increase his confidence and to know how to defend himself should he need to. He has learned those things and so much more. This isn't a skill he will ever lose. He will carry these lessons with him forever. Why do we attend classes at OSK? Why wouldn't we? We have nothing to lose and I have found the school to have a most positive impact on my son and will continue classes as long as he is interested in going to them. The rewards and benefits are just too great to ignore. I wish we had found the school sooner. I fully intend to sign my youngest up for karate classes when he is old enough! I'm proud to be a karate mom!" "We initially enrolled our sons in Little Ninjas to provide an outlet for physical activity during the winter months. Little did we know that the physical activity was only one of many benefits they would receive. Our 4-year old son, who was initially shy and timid, has gained self-confidence and independence. He has made noticeable improvements in coordination, following directions, and memory skills. Our 7-year old son has also demonstrated better self-control, focus, and patience since beginning Little Ninjas. We are very pleased with the benefits and experience our sons have received from Mr. Webb's instruction. What began as a winter outlet for our son's energy, has continued to be a fun and positive year-round learning experience." "My son Kyle started karate at age 7. The first time Kyle met Mr. Webb he asked him why he wanted to join the class, Kyle without hesitation said "I want to be a black belt." Kyle is now 13. He is a Jr. black belt. If you would ask him the same question today, you would get the same answer. There has never been a time that Kyle didn't want to go to class. He has been in other sports but this is the only one he has stuck with. He isn't satisfied just being a Jr. black belt, his goal is becoming an adult black belt. He now not only takes the kids karate class he also has started taking the adult class also. He is learning how to be a leader. He has become physically fit. He has gained endurance and stamina. He has learned to set a goal and through hard work and patience it can be reached. He has learned not to be afraid of learning new things. He now enjoys the challenge. He also has a place to burn off all the "extra" energy he has stored up at the end of the day." "Rhys and Karsen have really enjoyed participating in karate. They enjoy all the competitive drills and the teamwork games. Karsen has a tendency to be a shy child and I have noticed that she has really opened up since beginning at OSK. OSK has also helped Rhys expand the length of time he can pay attention. He does much better sitting and waiting than before he began OSK. I am very impressed with Mr. Webb's program." "Before Jacob started karate, he was really shy and didn't like people to watch him do stuff - he was extremely excited after his first day of karate - he's less shy and it seems like his confidence has been boosted." "Your class is doing wonders for my daughter and I love the way that she gets so excited to come to class, that's "Special!" We have talked a lot about kids in karate, well it's not just for kids, we have adult classes to improve physical fitness, stamina, focus and of course self-defense. You're never too old to start something new and the martial arts have kept many in shape who are even in their 60's. click on the "Get In" button below. A new page will open for you to see our complete class schedule and the option to sign up right away using our 100% money back guaranteed website offer. Just fill out the form below and "Get In" today! To secure your spot today, don't wait, put your name and email address in the form above and let us help your child develop their best weapon for success...Confidence!